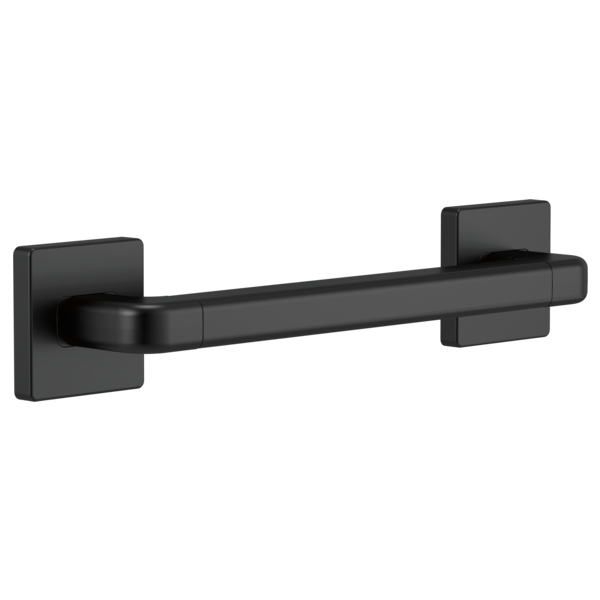 Angular Modern Decorative ADA Grab Bar - 12"
41912-BL is rated 4.1 out of 5 by 9. Rated 1 out of 5 by Lrg from Beautiful and very stylish. Purchased several of these grab bars ,in various lengths, for my bath remodel. I love their warm but modern look. Have received many compliments and highly recommend. Rated 5 out of 5 by bh from grab bar very stylish and well made. does not look like a grab bar that you normally see. Rated 5 out of 5 by Debbie from 12" Grab Bar Totally love the look of this grab bar. I have this size and the 18" located in my two showers. Look very modern without giving the impression that is also is a safety feature in the shower. Rated 5 out of 5 by Terij from Nice looking grab bar! Was looking for something to coordinate with the delta vero collection that was 12 inches due to space considerations. This serves the purpose and is pretty attractive given its function. Rated 4 out of 5 by Hanna from Big and chunky This is a lot chunkier than it appears in the picture. Also the polished stainless has sort of a bronze sheen. It does not blend well with chrome. I does however look nice on the glass, marble and stone trim tiles which are in various shades of brown and beige. Rated 5 out of 5 by Carol from Great grab bar Used this in shower where it doubles as a wash cloth holder as well as a grab bar. Like the squared lines and smaller length than typical. Can this bar be installed on shower tile for the purpose of only holding wash cloths?